A nuclear weapon derives its destructive force from nuclear reactions of fusion or fission. As a result, even a nuclear weapon with a small yield is significantly more powerful than the largest conventional explosives, and a single weapon is capable of destroying an entire city. In the history of warfare, two nuclear weapons have been detonated — both by the United States, during the closing days of World War II. The first was detonated on the morning of 6 August 1945, when the United States dropped a uranium gun-type device code-named "Little Boy" on the Japanese city of Hiroshima. The second was detonated three days later when the United States dropped a plutonium implosion-type device code-named "Fat Man" on the city of Nagasaki. These bombings resulted in the immediate deaths of around 120,000 people from injuries sustained from the explosion and acute radiation sickness, and even more deaths over time from long-term effects of radiation. Since the Hiroshima and Nagasaki bombings, nuclear weapons have been detonated on over two thousand occasions for testing purposes and demonstration purposes. The only countries known to have detonated such weapons are (chronologically) the United States, the Soviet Union, the United Kingdom, France, the People's Republic of China, India, Pakistan, and North Korea. Various other countries may hold nuclear weapons but have never publicly admitted possession, or their claims to possession have not been verified. For example, Israel has modern airborne delivery systems and appears to have an extensive nuclear program with hundreds of warheads (see Israel and weapons of mass destruction), though it officially maintains a policy of "ambiguity" with respect to its actual possession of nuclear weapons. According to some estimates, it possesses as many as 200 nuclear warheads. Iran currently stands accused by the United Nations of attempting to develop nuclear capabilities, though its government claims that its acknowledged nuclear activities, such as uranium enrichment, are for peaceful purposes, i.e., for nuclear power. South Africa also secretly developed a small nuclear arsenal, but disassembled it in the early 1990s. There are two basic types of nuclear weapons. The first are weapons which produce their explosive energy through nuclear fission reactions alone. These are known colloquially as atomic bombs, A-bombs, or fission bombs. 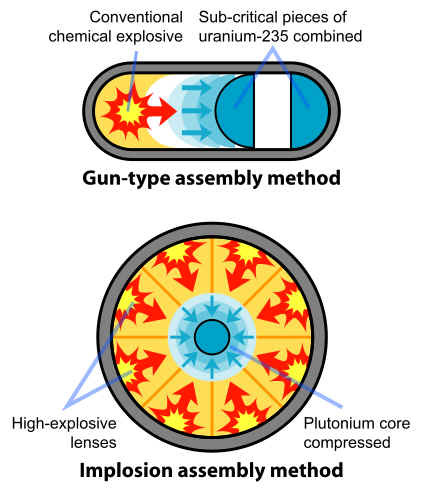 In fission weapons, a mass of fissile material (enriched uranium or plutonium) is assembled into a supercritical mass—the amount of material needed to start an exponentially growing nuclear chain reaction—either by shooting one piece of sub-critical material into another (the "gun" method), or by compressing a sub-critical sphere of material using chemical explosives to many times its original density (the "implosion" method). The latter approach is considered more sophisticated than the former, and only the latter approach can be used if plutonium is the fissile material used. A major challenge in all nuclear weapon designs is to ensure that a significant fraction of the fuel is consumed before the weapon destroys itself. The amount of energy released by fission bombs can range between the equivalent of less than a ton of TNT upwards to around 500,000 tons (500 kilotons) of TNT. The second basic type of nuclear weapon produces a large amount of its energy through nuclear fusion reactions, and can be over a thousand times more powerful than fission bombs as fusion reactions release much more energy per unit of mass than fission reactions. 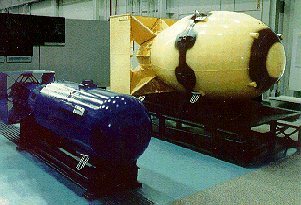 These are known as hydrogen bombs, H-bombs, thermonuclear bombs, or fusion bombs. Only six countries—United States, Russia, United Kingdom, People's Republic of China, France, and India—have detonated hydrogen bombs. 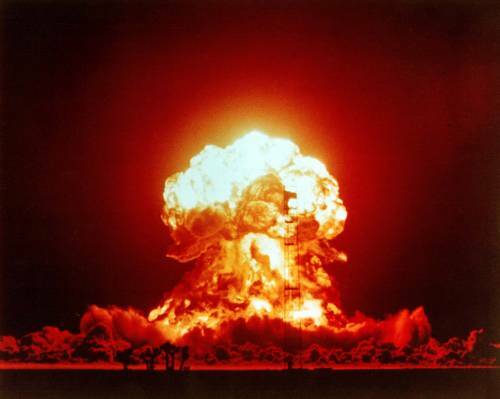 Nuclear holocaust refers to the complete or nearly complete eradication of human civilization by nuclear warfare. The word "holocaust" is defined as "great destruction resulting in the extensive loss of life, especially by fire." It is derived from the Greek term "holokaustos" meaning "burnt whole". Nuclear, or atomic warfare, is a war in which nuclear weapons are used. In the history of nuclear weapons, they have only ever been used twice in a state of war the atomic bombings of Hiroshima and Nagasaki. A fireball is immediately formed as the gamma rays from the explosion superheat nearby air and/or other material . For an explosion in the atmosphere, the fireball will quickly expand to a maximum size, then continue cooling as it rises through the surrounding cooler air. This becomes the characteristic mushroom cloud. Ground or water shock will result from explosions on (or near) the surface of the ground or water. This ground shock can damage or destroy hardened underground structures. In water this shock will be damaging to nearby vessels and may also produce a surface wave to limited ranges. A crater is formed by an explosion at (or near) the ground surface. The size of the crater depends on the type of ground material and how close to the ground surface the explosion occurs. Summary of effects is based on a 20-megaton ground-burst nuclear detonation above a city with a population of 2.8 million during the day when many people from outlying areas would be in the city working or shopping. The following summary of effects is based on a 20-megaton ground-burst nuclear detonation above a city with a population of 2.8 million during the day when many people from outlying areas would be in the city working or shopping. Within 1/1000th of a second, a fireball would form, enveloping downtown and reaching out for two miles in every direction from the point where the bomb went off, commonly known as ground zero. Temperatures would rise to 20 million degrees Fahrenheit, and everything--buildings, trees, cars, and people--would be vaporized. Out to a distance of 4 miles, the blast would produce pressures of 25 pounds per square inch and winds in excess of 650 miles per hour. These titanic forces would rip buildings apart and level everything, including reinforced concrete and steel structures. Even deep underground bomb shelters would be crushed. As far as six miles from the center of the explosion, the heat would vaporize automobile sheet metal. Glass would melt. Out to a distance of ten miles in all directions, the heat would still be intense enough to melt sheet metal. At this distance, the blast wave would create pressures of 7 to 10 pounds per square inch and winds of 200 miles per hour. Reinforced concrete buildings would be heavily damaged and all other buildings--masonry and wood frame--would be leveled. At a distance of 16 miles from the center, the heat would ignite all easily flammable materials (houses, paper, cloth, leaves, gasoline, heating fuel)—and start hundreds of thousands of fires. Fanned by blast winds still in excess of 100 miles per hour, these fires would merge into a giant firestorm more than 30 miles across and covering 800 square miles. Flames would consume everything within this entire area. Temperatures would rise to 1400 degrees Fahrenheit. The death rate would approach 100%. Firestorms of this type, though on a smaller scale, developed in Hamburg, Dresden, and in parts of Tokyo after conventional bombing attacks during World War II. The information gained from these experiences has particular relevance to the question of fallout shelters. In these earlier firestorms only those who left their bomb shelters had any chance of surviving. Those who remained in underground shelters were killed, roasted as their bunkers were turned into ovens and suffocated as the fires consumed all of the oxygen in the air. At 21 miles from ground zero, the blast would still produce pressures of two pounds per square inch, enough to shatter glass windows and turn each of them into hundreds of lethal missiles flying outward from the center at 100 miles per hour. At 29 miles away from the center the heat would be so intense that all exposed skin, not protected by clothing, would suffer third degree burns. To a distance of 32 miles second degree burns. Even as far as 40 miles from ground zero anyone who turned to gaze at the sudden flash of light would be blinded by burns on the retina at the back of their eyes. Within minutes after the bomb exploded 1,000,000 people would die. Among the 1,800,000 survivors more than 1,100,000 would be fatally injured. Another 500,000 would have major injuries from which they might recover if they received adequate medical care. Less than 200,000 people would remain without injuries. In the immediate post attack period, burns would constitute the most common and serious medical problem. Hundreds of thousands of people would have sustained major second and third degree burns, some from the direct effects of the heat flash on exposed skin, others injured in the thousands of fires that would rage on the periphery of the great firestorm. These people would need urgent and intensive medical therapy. It would not be available. In the entire United States, there are only 2000 special beds for burn patients. In most major metropolitan areas there are only 100 burn beds and most of these would have been destroyed by the bomb. At best, a tiny fraction of the hundreds of thousands of burn patients would receive appropriate medical care. The rest would die. In addition to these burn patients there would be many thousands of other injuries. People blinded by the blast flash or deafened when the pressure wave ruptured their ear drums. People with lungs collapsed by the tremendous pressures. People with stab wounds of the head chest and abdomen who had been struck by flying debris. People with bones broken when they had been hurled through the air by the hurricane force winds or trapped under collapsing buildings. Shortly after the explosion, there would be added to this list of casualties tens of thousands of others suffering from a unique form of injury: radiation sickness. The precise extent of radiation injuries would depend to a great deal on weather conditions; particularly the direction and speed of the wind at the time of the explosion. These factors would determine how far, and in what direction, the fallout would spread. People who were exposed to very high doses of radiation, 4000 to 5000 Rads, would suffer what is known as the central nervous system syndrome. Their brain tissue, damaged by the radiation, would swell, causing nausea, vomiting, explosive diarrhea, and progressive difficulty walking talking and thinking clearly. They would develop convulsions and pass into a coma and die, usually within the first day or two after the bomb. Once someone had been exposed to doses in this range, there would be no effective treatment. People exposed to lesser doses of radiation, down to about 400 to 600 Rads, would suffer a gastrointestinal form of radiation sickness. They would experience nausea, vomiting and diarrhea soon after exposure which would last for several days and then seem to improve. But, after a few days to a week, the symptoms would return and become worse. The diarrhea and vomit would become bloody as the lining of their stomachs and intestines, damaged by the radiation, began to shed. The majority of these patients would also die, despite the most intensive medical therapy. People with even smaller radiation exposure, in the 100 to 300 Rad range, would suffer from the hematologic radiation syndrome. They also would suffer nausea, vomiting and diarrhea for a few days, but these symptoms would resolve. About three weeks after exposure, their bone marrow would stop producing normal numbers of blood cells. As their white blood cell count fell, they would become prey to infection. Sores would form in their mouths. Burns and other wounds suffered in the initial attack would become infected and fail to heal. They would also have a fall in the number of platelets, the cell fragments that help blood to clot. They would hemorrhage into their skin, and new bleeding would begin in the intestines and stomach. Those who had received doses in the lower end of this range would have a very great chance of surviving if they received adequate care. Those at the upper end of the exposure scale would have a much worse prognosis, even if they received intensive therapy. Unfortunately it would be impossible to tell how much radiation a given patient had received. Except at the very highest doses, the initial symptoms would be the same. The already overwhelming problem of caring for the wounded would be complicated by an inability to decide who might benefit from therapy and should receive whatever resources might be available. The high temperatures of the nuclear fireball, followed by rapid expansion and cooling, cause large amounts of nitrogen oxides to form from the oxygen and nitrogen in the atmosphere (very similar to what happens in combustion engines). Each megaton of yield will produce some 5000 tons of nitrogen oxides. The rising fireball of a high kiloton or megaton range warhead will carry these nitric oxides well up into the stratosphere, where they can reach the ozone layer. A series of large atmospheric explosions could significantly deplete the ozone layer. A potential "nuclear winter" is another possible occurrence. This effect is caused by the absorption of sunlight when large amounts of soot are injected into the atmosphere by the widespread burning of cities and petroleum stocks destroyed in a nuclear attack. Similar events have been observed naturally when large volcanic eruptions have injected large amounts of dust into the atmosphere.